2019 applications for the Byron School of Art are now open. The BSA offers a series of year-long courses that provide an extensive grounding in the Visual Arts. These are structured programs incorporating drawing, painting, printmaking, 3D studies, design principles, art history and critical thinking regarding contemporary practice. Students can study for one to three years, beginning with the Visual Arts Foundation, leading on to Visual Arts Practice in second year, and then to the Research & Portfolio Course in third year. Course activities include studio work, ﬁeld trips, gallery visits, guest lecturers, and group exhibitions. The BSA will also be hosting an open day on October 14. From 11am to 2pm, you can drop in and walk through the studios and exhibition space in Mullumbimby, view current students' work and participate in the open drawing studio. It's a great way to find out more about the BSA and what they offer in terms of Visual Arts Education. For those interested in the Long-Course applications, there is an information session at 12pm. Applications for the 2019 intake must be received by 31 October, with intake interviews to be held in November. For more information visit the BSA website and look under LONG COURSES, where you may also apply online. If you have any questions, email admin@byronschoolofart.com or phone 0487 362 141. The common analogy ‘Life is a Marathon’ is explored by artist Geoff Todd in his new exhibition showing at Mitchell Fine Art in Fortitude Valley, Brisbane from 25th July. Culminating thirty years of artistic observation, Todd presents a series of poignant, powerful and sometimes aggressive artworks of two young female muses besieged with the contest of life. Join Geoff Todd for the opening of his new show on Friday 27thJuly from 6 – 8pm. This is a free event. On Saturday 28th July at 2pm, Geoff will also hold an Artist talk in the gallery discussing his work and inspiration. Australian exotica, a new travelling exhibition from Monash Gallery of Art (MGA), opens at Tweed Regional Gallery & Margaret Olley Art Centre on Friday 20 July. Drawing on MGA's nationally significant collection of Australian photographs, the exhibition showcases the works of some of Australia's most celebrated artists, engaging with the theme of the exotic antipodes. Since the 15th century, when European cartographers began including the contour of Terra Australis Incognita ('the unknown land of the south') in their speculative maps of the globe, the continent of Australia has been thought of as an exotic place. And when European explorers finally reached the southern continent, reports of unfamiliar flora, fauna and indigenous people only perpetuated this striking vision. The characterisation of Australia as a land down under, where things are out of the ordinary and colourfully unconventional, remains a key feature of this country's national identity. No longer just a projection of a European imagination, Australians themselves have come to celebrate the topsy-turvy nature of life in the land of Oz, where marsupials lay eggs, Christmas celebrations take place at the height of summer, and water supposedly goes down the drain in an anticlockwise direction. MGA Curator, Stella Loftus-Hills, said of the exhibition: "Our aim is to provide people with the opportunity to achieve a deeper appreciation of photography. This exhibition includes prominent Australian photographs that relate to what it means to be an Australian, or at least what someone looking in might think about this country." "I hope people would leave the exhibition feeling as though they had experienced something new about photography and Australia, something that perhaps they hadn't realised before," she said. Australian exotica features the work of 11 prominent Australian photographers, including Brook Andrew, Michael Cook, Destiny Deacon, Peter Dombrovskis, Marian Drew, Leah King-Smith, Joseph McGlennon, Tracey Moffatt, Darren Siwes, Robyn Stacey and Christian Bumbarra Thompson. All are welcome to attend the opening celebrations at Tweed Regional Gallery on Friday 27 July at 6pm with guest speaker Craig Tuffin, Photographic Artist. The exhibition will be opened in conjunction with Experimenta Make Sense and Alison Allcock: Exchange. The exhibition runs from 20 July to 23 September 2018. 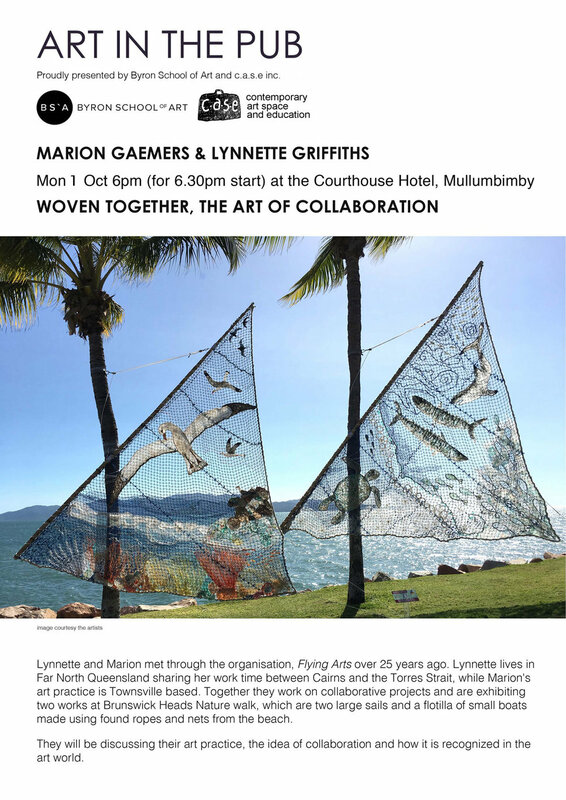 Join us at the Courthouse Hotel for Art in the Pub, as BAM Associate Editor Sharne Wolff and contributor Jane Denison speak about From Here to There: Australian art and walking. CUBE, the smallest gallery in the Southern Hemisphere, is located in Mullumbimby. July 10 sees a change over of art in the CUBE. Artists Noel Hart and Curator Dev Lengjel met at 2pm in the council admin in Mullumbimby to change over the exhibition from Jennifer Grainger to Noel Hart. for the last 20 years. The colours in the glass reference either species of parrots which are at risk of extinction, or, if they do survive the present onslaught, the colours of speculative as yet unevolved species. Northern Rivers Community Gallery (NRCG) Ballina launches an exciting new exhibition this month and welcomes community and visitors to join us in the Gallery. The Eighth Annual Grace Cruice Memorial Exhibition features new 2D and 3D fine art works by members of Ballina Arts and Crafts Centre Inc. The exhibition showcases the diverse talents of the group which draws its members from all over the Northern Rivers region. This exhibition celebrates the role played by early BACCI members in the establishment of the Northern Rivers Community Gallery and through this display, also hopes to encourage new members to join and share BACCI’s passion for creativity. Exhibition opens Wednesday 6 June 2018 and continue until Sunday 1 July 2018. The official launch event is Thursday 7 June from 5.30pm – 7.30pm and all are welcome to attend. The Trailer Project will present The Lure of the Sea by John Witzig opening Thursday, June 14 at Lismore Regional Gallery. Local Byron Bay Artist Holly English has been shortlisted for The 2018 Ledger Awards (Australian Comics Awards) with her comic book Byron Bay, a Time and Place, announced at OzComic-Con in Melbourne last weekend. Holly has also made the comic book The Book of Wonder and the petite zine Curious Places I've Made Love. She is now creating her new comic, Octopus and Lamb, due Spring 2018. All her comics are available online at hollyenglish.com, Junky Comics, Brisbane and Sticky Institute, Melbourne. Holly is a long-term local Byron Bay artist, Illustrator and creator. Ballina Shire Council and Northern Rivers Community Gallery will throw open the shiny new big red doors of Ballina’s newest art space, Ignite Studios @ NRCG on Saturday 5 May and everyone is invited to the party! The beautiful heritage building, formerly the Ballina Fire Station, has undergone minor building works over the last eight months in preparation for it’s new life as an arts space for the ongoing enjoyment of the community. The Launch Party is on Saturday 5 May 2018 from 9.30am until 2.30pm at ‘Ignite Studios @ NRCG’ located adjacent to the Gallery at 60 Crane Street Ballina. This a free family friendly event. The Northern Rivers Community Gallery is located at 44 Cherry Street Ballina and is open Wednesday to Friday from 10am until 4pm and weekends from 9.30am until 2.30pm. Openness, accountability, and honesty define government transparency. In a free society, transparency is government's obligation to share information with the people. It is at the heart of how citizens hold their public officials accountable. Artist Blak Douglas asks: Do governments in fact serve the people? What covenant has been made to the original custodians of this land? "Transparent Covenant explores the farcical landscape of 'Australian' politics and unashamedly portrays the systemic conspiratorial actions of successive governments to uphold the genocide on first nations peoples of this continent," says artist Blak Douglas. "I employ the ubiquitous 'toilet door' figurative logos as a perfect exemplar of the faceless Aboriginal individual today. The soul stripped countryman living at the bottom of the pile amidst an ever-growing fraternity of egotistical power brokers and their 'do good' policies." “Blak Douglas’s work is highly significant and profoundly bold in its depiction and message. What we have here is an artist that is completely dedicated to delivering the truth as he has it. Particularly focusing on what it means to be an Aboriginal man with part Irish decent in the 21st century. All the cultural clichés that haunt him and the ironies present within the “Australian Dream”. Still in her twenties, Kathryn Dolby’s artistic career is off to a strong start. In 2014 she won the Lismore Regional Gallery Graduate Award for her final exhibition installation work, Fluid and Fixed. The Lismore-born artist gained professional placement time in Sydney with Archibald-winning painters Ben Quilty and Guy Maestri. She has since become one of the region’s most recognisable emerging artists, as well as a new mother. Jamie. What inspired you to become a professional artist? Kathryn. When I was in high school the thought of feeling stuck in a profession I didn’t like scared me more than anything! So in a sense there was a kind of fear that motivated me to put my energy into what I loved. It never really felt like a decision to become a professional artist, it just felt like the most natural progression for me as nothing else ever really made me feel as myself, or as alive as when I’m creating or working with creative people. I think the inspiration began right back in primary school when we had guest artists doing demonstrations for the class and then through high school where my escape was the art block. My family were always supportive as they could see it was where my heart was, so it didn’t ever feel difficult in that sense. I know a lot of people struggled with family pressures but I was lucky to bypass that one. Jamie. How has your work developed over time, and what are your influences? Kathryn. The quality of materials for one thing; when I was young and starting out I'd raid the cupboard for tumeric, coffee and chocolate sauce to paint with! One of the first influential moments was when I was a teenager and saw an abstract expressive painting in a magazine, I don’t remember who it was by, but I felt the power of it leave the page and hit me right in the guts. So in the very beginning it was Abstract Expressionists like Pollock and De Kooning who excited me the most because of that sheer freedom in the expression. Over the years those influencers have changed after study and my appreciation for conceptual art grew. I fell in love with artists like Robert Ryman and Joseph Marioni and how they tease the viewer with a sense of space. So now, even if I’m painting in an abstract way I’m more conscious of loading the image with specific experiences or using the painting or installation to ask questions and challenge the eye. I really like to create a tension in the works. How simple is too simple? What happens if I just focus on this one colour? Or add a hard edge line next to all the gestural marks? It’s the most stimulating for me when each new body of work departs from the last and takes on new questions but it’s still steeped in your own experiences. I also spent some time over the last few years with some landscape painters who influenced my most recent paintings. I’d never perceived myself as a landscape painter but once you start looking you realise everything is a kind of landscape. Jamie. Is there a representational aspect to your works? Kathryn. Some work more so than others, but usually yes, although my work isn’t purely abstract or representational. They’re painted in an abstract way but subtly reference very real spaces, objects or encounters. I’m continually collecting and drawing from information in my daily life and then I return into the studio with it to pull it apart, deconstruct and reduce. It becomes a very intuitive process of reduction, where I might start with looking at a landscape, and by the end of the process the painting heroes just a single colour that I found most intriguing from that landscape. Abstraction allows much more freedom in the studio to be playful, to be able to mess with things and bend the rules so you’re not just creating a pretty picture. The works then become much more ambiguous and open for interpretation and I like that sense of not spoon-feeding the viewer but giving subtle clues. Jamie. What are your influences? Kathryn. I like looking to the poetry that is everywhere in the mundane routines of our daily life, the colours in the landscape and the spaces in the home. The repetitive action of washing and stacking the dishes, washing windows, moving house, walking, and sounds in the landscape. I’m very sensitive to the spaces I occupy and I think that really filters into the paintings. I’m a bit addicted to dramatising that sense of spaciousness in a lot of my work, as I love the quiet tension it creates. Like in music, the space in between the notes is often far more interesting that the notes themselves. An interest in that silence stems from being bombarded in our digital age with information and imagery, so it really began as a kind of reactionary respite to that. Jamie. Has having a child affected your work? Kathryn. It’s such early days to really see how she has affected my style, as she’s still so fresh, being 8 weeks old now! I’ve really just begun venturing back into the studio again, but having a child definitely shifts things and changes you in more ways than you can anticipate or ever be told. Artistically I think the whole experience has become rich fodder to work from and I feel like there will be a shift, even if it is in a subtle way … like drawing from the nature of sleep (or lack of it), of time and waiting. Throughout the pregnancy I had a lot of time to think and reflect on where I wanted my work to go. I love working from an intimate, personal and experiential level as I think it’s when you create the most honest and interesting work. I feel like this whole experience of becoming a mother has just given my practice another gear in that sense. But it will definitely be a time juggle. I was chuckling about it with another artist and first-time mumma friend of mine who said I’ll have to just go in there and throw the whole paint tube at the canvas and hope for the best! But really I think it’s a very interesting topic and I’ve been brewing some ideas about getting other artist mums together for a project or two. Part of ArtState 2017, We’re Closer Than You Think brings together artwork by several artists based in the Northern Rivers. The exhibition questions the notion of regionality and the perception that artists working outside of metropolitan areas are hindered by location. In various stages of their career and working across a range of disciplines, each artist in the exhibition was chosen for inadvertently refuting the relationship between location and success, population and production, and that the quality of their practice is determined by these imaginary borders. Be quick! We’re Closer Than You Think will be open until Friday 8 December. Co-curated by Natalie Bull and Zoe Robinson-Kennedy. Image: Helle Jorgensen, The lofty thoughts generator and processor. Photo by Michelle Eabry. Byron School of Art is presenting two exhibitions as part of ArtState: Nine, at the BSA Project Space, and APOLLO in Lismore. Also, BSA Alumni are showing throughout Lismore, including at the old Lismore Regional Gallery site. Apollo is a group show from the Byron School of Art BSA Project Space. It is a re-pairing of works and an assembly without the limits of the square: both documenting a number of past exhibitions and responding to the semi-submerged toy theatre where the exhibition is housed. **Complimentary Stone & Wood Beer and Miami Mimosas on the house, all night! Riding along the undercurrents of Turner Prizes and Archibalds, #PRIZENOPRIZE is an exhibition that champions and democratises art across all media and levels. Think of it as a soft power alternative to the head-churning, nail-biting process that comes with applying for art awards - or being shortlisted for the coveted Bachelor rose of the artworld. There is no prize money, entry fee or % commission on sales; instead this is an open platform for contemporary and experimental artists (especially emerging artists) across Australia to exhibit/perform at THE WALLS this December -- which we think is a prize in itself. We'll be showcasing a cross-section of works, including multi-disciplinary, projection and moving-image based, performance and large-scale installation works. #PRIZENOPRIZE 2017 marks the second year of the national open call and exhibition. CHASE ARCHER is an emerging artist based in Brisbane. Chase obtained his Bachelor of Fine Art in 2015 from the Queensland College of Art and is currently completing his Honours. Archer questions how traditional media practices such as painting, print and drawing can maintain relevance in a contemporary environment that is focused on dematerialised art practices. He describes his artworks as painted collages, assembled from images ranging from personal iPhone photos, to the historic art canon. In creating artworks on translucently primed plywood substrates, which remain visible in the final artworks, Archer disrupts the ‘illusory window’ often employed in traditional paintings, creating a platform in which he presents his deconstructed artworks. Archer regularly exhibits in Brisbane and Melbourne, and recently completed a month-long residency on the west coast of Tasmania. HAILEY ATKINS is a Brisbane based artist making work that she hopes makes people feel good and remember laughing is good stuff – especially when it’s at your own self. Her sculptural practice sits at the intersection of humour, failure and ambivalence, and explores how the resulting aesthetic can be utilised to meaningfully disrupt the negativity surrounding failure and self-doubt and help us think of alternate ways of being and knowing that stand outside our conventional understanding of success. Atkins is a Queensland College of Art graduate (BFA with Honours (Class I)) and has exhibited widely in Queensland, as well as interstate (Sydney, Hobart) and internationally (Utrecht, Netherlands). She is co-director of Wreckers Artspace in Brisbane, and upcoming artist in Residence at Kaus Australis, Rotterdam (Jan-Mar 2018). JANIS CLARKE is an emerging artist living and working in Sydney. He has completed a Bachelor of Fine Arts (2015) and a Master of Fine Art (2017) at the National Art School. Clarke has a profound interest in the critique of painting in contemporary art. He consciously undermines established norms (both personal and historical) and to this end, he embraces failure and the anti-aesthetic sensibility as strategies for moving painting forward to somewhere new. He does this through the use of anti-authorial gestures, the kitsch of craft, and by embracing the use of so called ‘low’ colours, materials and processes such as fluorescents, spray paint, collage and decoupage. By employing counter-intuitive methods (such as ‘wrong’ instead of ‘right’) Clarke tries to undermine his own ingrained stylistic tendencies to create something unanticipated. Situated somewhere between painting, craft and sculpture, these abject principles are applied to the installation, presentation and construction of each work. Since 2015 Clarke has held three solo exhibitions and has been selected as a finalist in major prizes including the Doug Moran National Portrait Prize (2016, 2015), The Mosman Art Prize (2016, 2015), The Chippendale New World Art Prize (2015 - Winner People’s Choice Award) and the Rick Amor Drawing Prize (2016). RICKY LARRY is a Brisbane based artist who completed a Bachelor of Fine Art (2014) at Queensland College Of Art. Since graduating from Queensland College of Art in 2014 Ricky has held two solo exhibitions and been selected for several group shows including 'Shifting Grounds’ at The Hold Gallery, West End. Larry’s art practice examines the nature of perception in relation to space, environment and form through the use of photography, video and installation. Utilising materials to challenge a logical thought process, illusions are introduced in an attempt to fracture the viewer’s go-to mode of rationality. Incorporating ‘objects’ into familiar environments to generate a “questionable image”, forces the audience to draw conclusions as they make sense of the works. SOPHIE PENKETHMAN-YOUNG is a video and new media artist whose work explores the telling of histories through objects, museum culture and their intersection with the digital age. She examines the equalising nature of platforms such as youtube, where the BBC, Metropolitan Museum and NASA have uploaded vast archives, that now sit in the same context as beauty bloggers and school pranks. Sophie graduated from the University of Sydney College of the Arts with Honours in 2014. She is currently studying her Masters in art curatorship. Day to day, Sophie works part time in marketing at Carriageworks, does Ikebana and adDs to her archive of NASA footage and old national geographic magazines. MELISSA SPRATT is an emerging artist who lives and works on the Gold Coast. Melissa studied at the Queensland College of Art, Gold Coast, where she completed a Bachelor of Digital Media with Honours, majoring in Fine Art in 2015, including an exchange at the Leeds International Summer School at the University of Leeds, UK. Spratt has worked across various mediums including painting, photography, drawing and printmaking, more recently exploring textile and design elements in sculpture, and working closely with different yarn making and finger-knitting techniques. Spratt was the winner of the RADFLY Youth Art Prize in 2017, finalist in the Border Art Prize at Tweed Regional Gallery in 2016, and was invited to hold a self titled solo exhibition at The Arts Centre Gold Coast in 2015. Her most recent installation works explore landscapes, ecosystems and patterns found in plant anatomy. VEOPLE is a collaboration between Gold Coast-based artist JAY JERMYN and local musician JULIAN CURRIE, and is best described as a place where analogue meets machine. The collaboration strives to create atmospheric journeys full of energy and enigma that demand attention and captivate crowds. Jermyn solo practice communicates the weight and importance of social acceptance through an interweaving of creative expressions including design, sound and visual art. Jermyn studied Art and Design at Griffith University on the Gold Coast where he developed a multi-disciplinary practice that seeks to confront cultural divisions, both geographical and metaphorical. His practice is influenced by journeys through Japan and Eastern Europe, and is defined by an ongoing quest to locate enigmatic identities and emotions; both of which emerge as abstract and ambiguous forms in his work. Art on Bundjalung Country opens tonight at Lismore Regional Gallery. Increasingly, creativity is being seen as a major indicator in increasing people’s health and wellbeing. Art on Bundjalung Country is a major partnership between the Gallery, Arts Northern Rivers, North Coast Primary Health Network, Bulgarr Ngaru Aboriginal Medical Corporation and University Centre for Rural Health to stimulate artistic practice for emerging Aboriginal artists to enhance their social, economic and health outcomes. This partnership is advised by a committed steering group of Aboriginal and non-Aboriginal arts and health professionals. Throughout 2017, a series of workshops have been held across the region by established Aboriginal artists including Penny Evans, Gilbert Laurie, Francis Belle-Parker, Michael Philp, Cherie Leon and Robin Davis to pass on their creative skills to a wide range of emerging Aboriginal artists. The result will be an exhibition acknowledging the depth of current practice in the region, and celebrating the next crop of up and coming Aboriginal artists working in Bundjalung country. To be opened by Dr Vahid Saberi, Chief Executive Officer, North Coast Primary Health Network. Speeches will be followed by a performance by the Nini Nahri-Gali dance Troupe. Applications to exhibit at Lone Goat gallery are now open. Applications for the 2018 program will be accepted until January 31 2018. Lone Goat Contemporary community art gallery is located in downtown Byron Bay, right across the road from the beach. Saturday evening revealed the (joint!) Winners of the inaugural Art Piece Gallery 30x30 Art Prize: Kat Shapiro Wood, and Vanessa Stockhard. The $6000 prize will be divided between the two artists. As expected, a huge crowd turned out to witness the announcement. The previous day, judges Susi Muddiman OAM and artist Amanda Penrose Hart, winner of the 2017 Gallipoli art prize had considered all 230 pieces, and after much deliberation, decided to equally divide the First Prize between two artists. The exhibition of finalists will be on view at the gallery until January 22 2018.
by voting in person, at the gallery. This new, national, non-acquisitive prize is for a 2D work of art in any medium measuring 30x 30 cm.